Yes at last you can have all the convenience of NiceCupOfTeaAndASitDown.com in handy book format, thanks to that miracle of the information age, the printing press. Inevitably its bound to be full of stuff about biscuits, and it is. 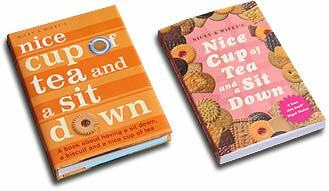 Mind you there's a lovely section all about tea, a little bit of cake and a nice relaxing sit down bit at the end. Oh and Wifey has her say from time to time so watch yourselves. Tea drinkers don't tend to have moderate and liberal views on tea. We all like it the way we like it, whichever way that may be. I'm not about to come up with something as quickly doomed to failure as a pronouncement on how to make the perfect cup of tea. If you've ever made a cup of tea for somebody else chances are that they then politely complained about it being too weak, too strong, too milky or in the wrong sort of cup. You'll know that when it comes to tea one size does not fit all. So its not the recipe for the perfect cup of tea that I'll be discussing but some of the obstacles that get placed in our personal paths to it. We all have our favourites for our own highly individual reasons and its not just the way that they taste. Often its to do with a time or place that they accompany us to whilst we munch away. To mark them out of ten would be undignified and meaningless, so I'll just share my personal thoughts on them with you. You might not always agree with me but then that is to be expected. I hope you will agree that many have a curious personality that is worth a second look. All these important biscuits groups, plain dunkers, digestives, shortcakes, oats, jammy biscuits, marshmallow things, gingernuts, chocolate covered, fruity, icing, wafers and foriegn ones. Ohh, and bonus bits on wrappers, homemade biscuits, the distance to the moon and Hansel & Gretel. Although it is biscuits that most often accompany our cuppas, from time to time cake pops up. So I've made left space for a little bit of cake near the end as a special treat. Cake would like a much bigger bit, as it can be quite filling, but I've kept it down to a few slices of my favourite ones. Wedding cake, it just wants to be loved. Fairy cakes, and the truth behind pink icing. 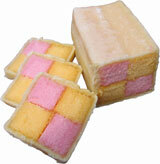 Packet cakes, featuring Ginger cake and barking mad Battenburg. We take a look at some of the many varied ways in which we pursue that relaxing sit down so crucial to a successful cup of tea. From not sitting down at a stand up buffet, to sitting on your coat on the floor whilst sipping tea from your vacuum flask, when tea is at hand the sit down is sought after. If we are already sitting down, then the need for tea increases, and I'll look at some of the situations in which we risk scalded fingers, wet clothes, puncture wounds and instant tea just to capitalise on our sedentary circumstances. The folly of standup buffets. Tea on the move, trains, coaches and planes. Tea in public, how not to look like a tourist. Christmas, the mince pie arms race.